I decided to make these for our Christmas Eve tea (along with the aromatic Christmas ham and a salad), knowing that they would be a fairly simple dish to put together before the work of the Christmas Day roast). 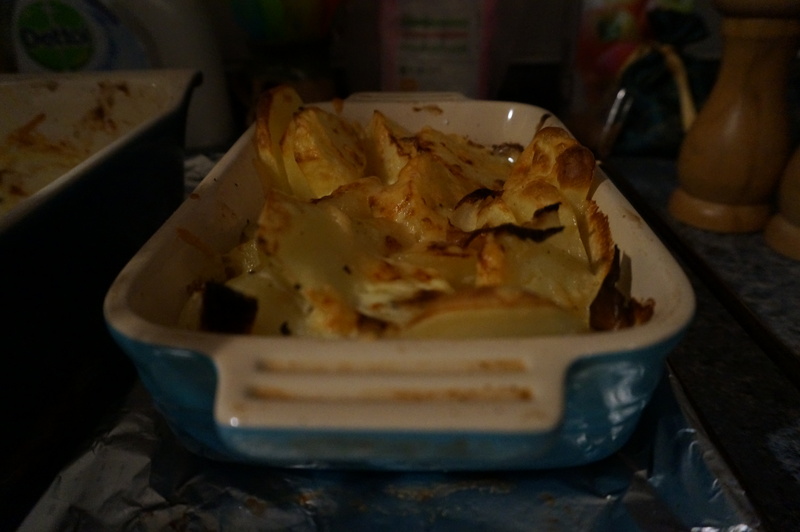 I peeled and sliced the potatoes and onions Christmas Eve morning, so that all I needed to do when my family arrived was boil the potatoes, pop them in a roasting tin with cream and grated cheese and then cook them in the oven for 15 minutes. This worked well with reheating the Christmas ham, which needed about 5 minutes in the oven before the whole meal was ready. The whole meal worked well, and was nice and easy to prepare. It was a great choice for an easy Christmas Eve meal, and the only thing left over was a bit of ham – which was great for a late, easy tea on Christmas Day evening.